From the same people who teamed up to bring us the graphic novel adaptations of the Eoin Colfer’s first two Artemis Fowl books comes the graphic novel adaptation of Colfer’s The Supernaturalist. In my review of the original book, I complained about how everything moved so fast that I had problems picturing things in my head, even when I slowed down and re-read passages for clarification. I had hoped that the graphic novel would clear up some of those things and help me to see certain aspects of the book more clearly. In a way, it did, but I didn’t agree with the way everything was portrayed. For starters, why do the lightning rods look like guns? A “rod” is a straight, stick-shaped piece of wood/metal/etc…guns don’t look like that. I also didn’t care for the way the Parasites were drawn; I had imagined little blue beetle-like creatures, similar to R.A.L.P.H. from Spy Kids 2. And, lastly, Cosmo looks too effeminate for me…at least, he does while he still has hair. When the hair is gone, he looks better, but the way he is shown on the cover (he’s the one in the front) just looks bad. I suppose I can’t complain, though; you know what they say – beggars can’t be choosers. Still…I wish things like those had been closer to how I initially envisioned them. The artwork is sharp and the colors are nice, though the limited color palette used (a sort of grungy, dark one) would not have been my initial choice. It works, though, and it does a great job of capturing the tone of the book. Satellite City is not a nice place to live, and this choice of color palette emphasizes that point pretty clearly. 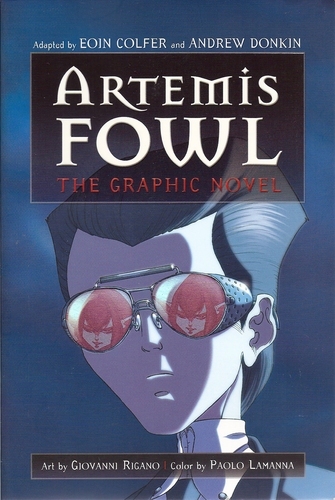 Like the Artemis Fowl graphic novels, The Supernaturalist is very condensed and occasionally choppy and understandably so. It’s not like they can make the graphic novel the same length as the book, and I had just finished re-reading the book anyway, so it didn’t really bother me. What did bother me, however, is how the artwork was occasionally drawn across both the left and right pages – something that would have been fine if they did a better job of indicating when the story continued across the page gap. There were too many times when I would read left to right, top to bottom on the left page, confused, only to glance at the top of the right page and discover that the artwork from the left had continued onto the right in one big panel. I got quite irritated. Aside from those one or two little quarrels, The Supernaturalist: The Graphic Novel makes for a nice companion to the original book; as is the case with the Artemis Fowl graphic novels, it is better to read one (the book) or both, but never the graphic novel alone – you miss out on too much when you choose not to read the book, just as you would with watching a movie adaptation of a book. 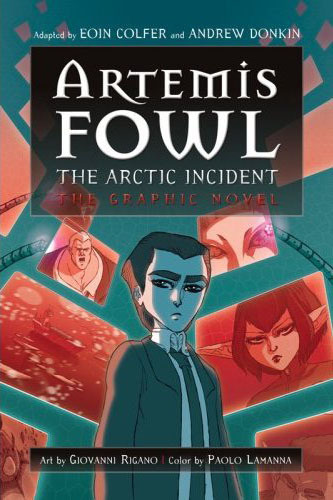 Overall, the Artemis Fowl graphic novels look better and flow better, though…in my opinion, of course. Read them all and decide for yourself! P.S. – In case you missed it above, read my review of the original book that this graphic novel is based on here! Last week, I decided to order a few graphic novels online, and, supposedly being the best Batman comic ever written, Batman: Year One was at the top of my list, along with The Long Halloween and The Killing Joke (don’t worry; The Dark Knight Returns is also on my list!). They all arrived in the mail today, and Year One was the first I read. Holy awesome, Batman! I’ve only read a few comics in my day, and none of them were Batman; this blew them all out of the water. Though I really enjoyed the artwork, it was the story that really amazed me. It was well-written and did something that I didn’t expect from a Batman comic: it focused more on Jim Gordon than Batman. You see, the “Year One” in the title refers not only to Bruce Wayne’s first year in the suit but Jim Gordon’s first year on the Gotham police force as well, and he’s really the focus of the story. It’s quite clear to see that Christopher Nolan and David S. Goyer’s screenplay for Batman Begins drew heavily from this graphic novel, borrowing elements like Batman’s reason to dress like a bat, the inner corruption of the Gotham PD, and other like elements. Lieutenant Fox (as he is at this point in time) is tough and well-liked by the community but not by his co-workers, adding on stress to an already stressful job. We see the effect of the death of Batman’s parents in his childhood and how it affects him as an adult, and we see that, even early on, Batman does whatever he can to stop crime without killing. The emphasis of the story is summed up at the start of one of the chapters, when it refers to Gotham as a city that “likes being dirty”, and it’s the job of Gordon, a clean cop in a dirty PD, and Batman, a caped crusader who instills fear in the criminals of Gotham, to wipe out crime and make the city a place that no longer needs a Batman. The art is fantastic, the story is grounded and real, and it is the definitive origin story of Gotham’s Dark Knight. This is a great place for anyone to get started in Batman comics. Like the first one, the graphic novel for The Arctic Incident is a visual treat that is a very faithful adaptation of the source material. In fact, both graphic novels largely feature direct quotes from the books on which they were based, which is both a blessing and a curse. Oftentimes, the direct quotes are words by the author that were not actually spoken by the characters, but are rather given from the outside. Using quotes like this in the graphic novel usually requires attributing them to the characters on hand, which often comes across as awkward and unnecessary. I also feel like the potential of the graphic novel format was wasted. Yes, I’m glad that they were faithful and that they looked great, but why would you only adapt it? Why not give it something new that you wouldn’t get from the book – aside from pictures, of course. There were a couple of instances in The Arctic Incident‘s graphic novel where you get pages that are intended to be background information, but even these are sometimes direct copies from the book. I don’t think it’s too much to ask to maybe sneak in background information in the same manner that wasn’t in the book. Give us something new to chew on. However, one thing that I really do enjoy about the graphic novels is that it gives me a chance to clear up some things if I had trouble visualizing something from the book on my own. Since Colfer was directly involved with the creation of the graphic novel, it’s safe to say that, for the most part, what we’re seeing is how he initially envisioned the characters he created, as well as the situations he put those characters in. Despite its flaws, The Arctic Incident: The Graphic Novel is very good – an excellent companion to its book counterpart. If you choose to read only one, read the book. P.S. – Read my review of the original book that this graphic novel is based on here! The story is very well-adapted by the author and Andrew Donkin, and the art/color are quite vivid and a pleasure to behold. While most of the characters looked differently than I imagined, getting to see this world come alive was just the best. If you like the book, buy the graphic novel. However, I would definitely recommend it as a companion to the book; it’s too (understandably) choppy to stand on its own.